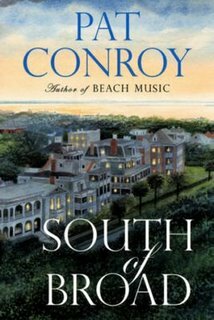 It's taken 14 years, but Pat Conroy has created another southern masterpiece. South of Broad, set mostly in Charleston, features the grand themes of religion, class, race and the bonds of family/friendship, but it it also includes just about every social issue I can think of - integration, suicide, mental illness, AIDS, abuse, poverty... Throw in team sports, military education, an affair or two, and a natural disaster (Hurricane Hugo), and you begin to get an idea of it's scope. There is seriously enough material here for three novels. By the end of the book, I felt like I'd been through an emotional wringer... and I loved every page of it! South of Broad's plot will keep you turning pages into the wee hours and the characters will linger in your mind long after you've finished the last chapter. Of course, you'll find Conroy's signature lush, lyrical prose, too. Before reading my first Pat Conroy novel, "author" and "fan" were words I'd never considered using in the same sentence. I was an avid reader, had several favorite authors, but "fan" didn't exactly describe the relationship. The word seemed more appropriate to use with a band, singer, team, maybe even an athlete... not an author. In 1986, The Prince of Tides changed all that. By the time I read Beach Music in 1995, "groupie" might have even seemed fitting. In 1996, my mother and I had the opportunity to hear Mr. Conroy speak during The Rosamond Gifford Lecture Series second season. We were positively entranced! The entire audience was under a spell. Quite a few lecturers have come and gone since then (I'm even a season ticket holder now), but that evening remains one of the most memorable. Pat Conroy's novels also inspired my own visit to Charleston. In the late 1990's, when the girls were young and my parents agreed to a long weekend of babysitting, I surprised my husband with a "mystery trip" for Valentine's Day. Charleston, and the Charleston Place Hotel, was our destination. The city was all I'd hoped for and, after reading the novels, it almost felt like visiting an old friend. Be sure to visit Pat Conroy's website for further information. South Of Broad will be released in paperback on May 4. The publisher has generously offered a copy to one of my readers. If you're interested, let me know in the comments. Please include your email address. I'll draw a winner on May 6. The publisher will ship the book - open to residents of the US and Canada only. 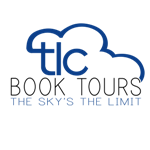 This post is part of a TLC Book Tour. A review copy was provided by the publisher. The complete tour schedule may be found here. 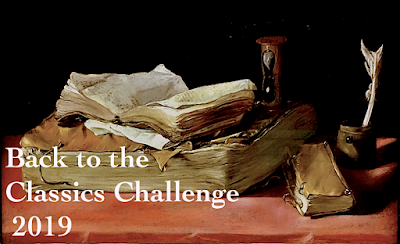 It's week 4 of our Wuthering Heights Wednesday read-along hosted by Jill of Fizzy Thoughts. Heathcliff returns three years later. Cathy is overjoyed; Edgar, not so much. Isabella takes a fancy to Heathcliff. Cathy tries to convince Isabella of Heathcliff's true nature, then humiliates her in front of Heathcliff by revealing Isabella's feelings. Mrs. Dean encounters Hareton, who has turned into a monster of a child under Heathcliff's influence. Heathcliff makes advances toward Isabella. Cathy and Heathcliff have words; Edgar barges in. Heathcliff and Edgar are about to duke it out, but Edgar falls to a chair in tears. Heathcliff says he can't believe Cathy chose such a wimp over him; Edgar pops out of the chair and clocks him. Edgar gives Cathy a "him or me" ultimatum. Cathy has a "spell", then takes to her room, refuses to eat, and may be near death. Isabella runs off with Heathcliff. Conditions are deteriorating at both Thrushcross Grange and Wuthering Heights as Heathcliff begins to carry out his revenge. The only certainty at this point is that things will get much worse. There seems to be a mystical, almost cosmic, element in the relationship between Cathy and Heathcliff. I'm looking forward to seeing how it unfolds. It was difficult to stop at the end of chapter 12 - I'm loving this book! See Jill's post for a complete list of participants. 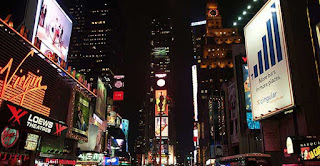 Last week's Sunday Salon found us at the Marriott Marquis in Times Square. Our excuse for the trip was to transport Daughter #1 to a New York Times seminar for college newspaper editors, but we also wanted to be in the city just in case Twin A's Poland trip took off (it didn't). We had a wonderful time... saw Mary Poppins on Broadway, ate at some fabulous restaurants, did some shopping, spied Kelsey Grammer getting out a limo, and explored the city. While the girls spent time in Urban Outfitters, my husband and I wandered a few blocks up Broadway and stumbled upon Shakespeare & Co. Booksellers. I could have happily browsed there for hours, but the girls finished their shopping and needed us to return with the credit card, so we exited with just a couple of books. Our next stop would be The Strand Bookstore - famous for its 18 miles of books. 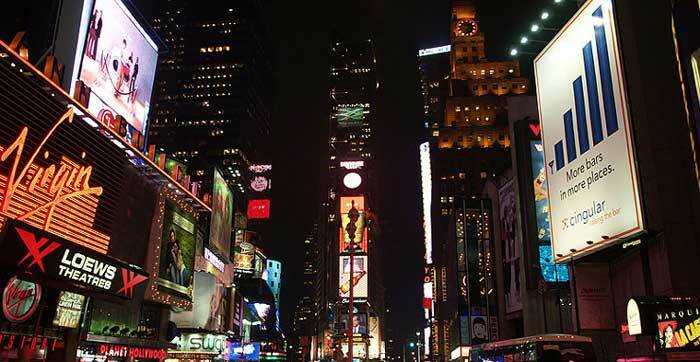 Another brisk walk up Broadway, and I was finally there! Is this a book lover's paradise or what? Daughter #1 was nearly as overcome as I was, but my husband groaned... he knew this would take a while! The other girls were (sort of) happy to browse, but it was nearly 9PM and hunger pains were becoming a problem. Turns out we only had half an hour, but I did purchase nine books. I suppose it would have been dangerous to spend much more time there anyway. The family was impressed when I came away with nine books "without even trying", but the best part is that these are books I couldn't find at my local B&N or Borders. Daughter #1 landed a summer internship at ESPN. She'll be living in the NYU dorms, so we have an excuse to visit again! I'm struggling with Tinkers by Paul Harding, the slim (191 pages) book that recently won the Pulitzer Prize. The writing is beautiful but, after 70 pages, I'm not really engaged. My new stack of books may be partly to blame... this could be a DNF. We passed our 'home visit' and hope to have a dog in 4-6 weeks. Finally, apologies for the rambling post... there's been a lot going on around here. Hope you have a wonderful Sunday. Will you be spending part of it with a good book? You might remember a March post, Baking As Therapy, that featured Twin A and her Oreo Truffles. She was overwhelmed by your comments, so positive and encouraging, and inspired to embark on a new adventure. We have launched Lakeside Kitchen - a mother/daughter project that will chronicle our culinary adventures. 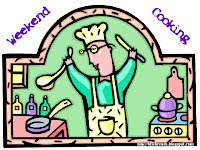 We've had fun setting up the blog and posting a few pictures and recipes. Margaret (formerly known as Twin A) loves to bake and is beginning to experiment with breads. I'm hoping to include a main dish recipe each week, too. Lakeside Kitchen is a work-in-progress, but we invite you to stop by and take a look. Ever since my rediscovery of the short story last year, I've noticed a growing fascination with all short literature forms. I recently marveled at Anthropology by Dan Rhodes - a collection of 101 love stories, each told in 101 words. 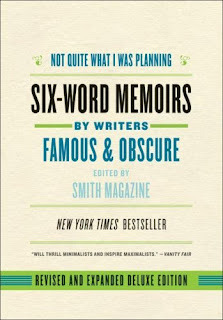 So when Kim mention Six-Word Memoirs in a comment, I just had to check it out. A few of my favorite six-word memoirs have already appeared in this Teaser Tuesday post. The wide range of feelings or tones that can be conveyed with only six words is amazing. There are many, many more 'memoirs' to discover for yourself. This slim volume will make you laugh... it will make you think. You may not need to own this one, but at least borrow it from your library or leaf through it next time you visit the bookstore. It's five weeks later and Catherine finally returns to Wuthering Heights, just in time for Christmas. Her appearance is dramatically altered and she appears quite the lady! Heathcliff has also changed, but not for the better. While working hard for Hindley, he has become dirty and neglected. He cleans up nicely for Christmas, but a slight altercation that leaves Edgar Linton with applesauce all over his face gets Heathcliff banished to his room. Cathy sneaks away to visit Heathcliff. Heathcliff vows revenge on Hindley. Hindley's wife dies of consumption after giving birth to a son, Hareton. Things get even worse at Wuthering Heights - Hindley has become a ruthless tyrant, Cathy becomes more arrogant (she even slaps Mrs. Dean), and Heathcliff seems to be turning into a monster. Edgar Linton asks Cathy to marry him. She accepts, but confides her doubt to Mrs. Dean. Heathcliff overhears only part of this conversation and takes off to the moors. Cathy goes searching for him, but ends up with a cold and fever instead. She is again off to recover at Thrushcross Grange, but passes her illness on to Mr. and Mrs. Linton. They both die in short order. Cathy and Edgar marry. Mrs. Dean joins them at Thrushcross Grange. Heathcliff is still MIA. Wow, wow, wow! This is powerful stuff: Cathy loves Heathcliff - Cathy is Heathcliff. But where is Heathcliff? Before beginning this book, I had no idea Cathy was such a piece of work. What does Heathcliff see in her? Although it has taken a bit of self-control, I'm sticking to the schedule... more than ready to continue with chapter 10. I'll check in again for Wuthering Heights Wednesday. Have a great week! 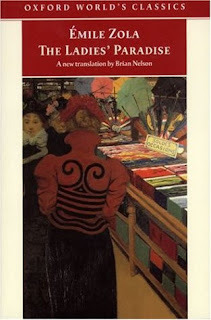 Novel, social commentary, business manual... however you classify The Ladies' Paradise by Emile Zola, this 125 year old classic possesses a surprisingly contemporary feel as it chronicles the rise of the modern department store in Paris. The novels opens with Denise, a recently orphaned shopgirl from the country, arriving in Paris with two younger brothers in tow hoping for assistance from her Uncle Baudu. Baudu, owner of a small family-run business, operates his shop literally in the shadow of The Ladies' Paradise and balances precariously on the brink of failure. He is full of anger and resentment toward the store and it's owner Octave Mouret, "master of the terrible machine". Denise, however, is "bewildered and attracted" by the giant shop, while feeling an "instinctive repugnance for [her uncle's] icy little place where the old-fashioned methods of business still prevailed." Since her uncle cannot offer her a position, she secures employment at The Ladies' Paradise. Mouret employs surprisingly modern and sophisticated marketing techniques to build his "machine" (huge sales, dazzling displays, publicity and marketing gimmicks, a return policy) in an attempt to attract the women of Paris. Zola is a master of description. There are many gorgeous, almost sensual, passages detailing the wares at The Ladies' Paradise. As the department store grows, small businesses suffer and die. Zola skillfully portrays their struggle through the Baudus. Simultaneously, thousands gain employment at The Ladies' Paradise. The store provides housing, meals, and social activities for its employees, thus promoting the formation of a "vague" new social class. Underneath the social commentary and marketing strategies, intriguing story lines can also be found - competition and gossip among the salespeople, the decline of the Baudus and other small shopkeepers, love affairs, Denise's struggle to provide for her brothers and advance her career, and, most importantly, Mouret's growing fascination with Denise. The Ladies' Paradise is a fabulous book and will likely be among my favorites this year. Therese Raquin was a favorite last year, and Emile Zola has earned a spot on my "favorite authors" list. 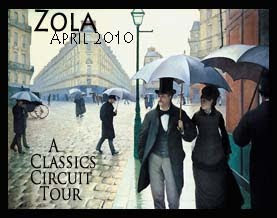 This review is part of The Classics Circuit: Paris in the Spring Emile Zola Tour. The entire schedule can be found here. 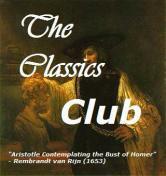 Visit the Classics Circuit website for information on upcoming tours and links to previous stops. It's week two of the Wuthering Heights Wednesday read-along sponsored by Jill at Fizzy Thoughts. We've just reached the 50 page mark, so if you're thinking of joining us, it's not too late! After a disturbing night at Wuthering Heights, Mr. Lockwood has returned home to Thrushcross Grange. That evening, before the roaring fire, he draws Mrs. Dean (the housekeeper) into conversation. Through her, we begin to learn the background of the Earnshaw and Linton families. It turns out that Heathcliff was an orphan "found" by Mr. Earnshaw on a trip to Liverpool and brought home to be part of the family. Hindley Earnshaw took an instant and strong dislike to the dark, "gypsy-looking" boy, while young Catherine (Cathy) grew "too fond" of him. Hindley is sent away to college. Upon Mr. Earnshaw's death, Hindly returns (with a wife). Catherine and Heathcliff, not closely supervised, are allowed to grow up wild on the moors. One Sunday, as they are peering in the windows at the wealthy Linton family of nearby Thrushcross Grange, Cathy is attacked by the family's bulldog and must remain there to heal. Heathcliff is sent back to Wuthering Heights. Rough as a saw-edge, and hard as a whinstone! The less you meddle with him the better. What a surprise - another narrator! I love multiple narrators and the opportunities they provide to see characters and events from different viewpoints. Mrs. Dean is in the perfect position to furnish Lockwood (and the reader) with background information on members of the Earnshaw and Linton families. She was in the household when Catherine and Heathcliff were growing up, then went to Thrushcross Grange to be with Catherine following her marriage to Edgar Linton. "Finding" an orphan and bringing him home is a little strange. I wonder if there will be more revealed about Heathcliff's origin. The relationships between the two families are still confusing, but the genealogical table in my new Penguin Classics edition really helps. I mentioned on twitter that I was considering purchasing a new copy (the old paperback my daughter had wasn't cutting it) and several bloggers jumped at the chance to enable the purchase! Aren't these editions gorgeous? I'm looking forward to learning more of the family's history and wonder how long we'll be treated to Mrs. Dean's voice. It's the day after... Read-a-thon appears to have been a huge success and, once again, I missed it. My plan is to block out the fall date as soon as it's announced. We had a full schedule of family events yesterday - from ACT testing (involving a half hour drive each way for both drop-off and pick-up) to two family confirmations and parties. This Sunday Salon post will be a quick wrap-up of the week, and then I'll start reading. The Classics Circuit visits on Saturday and I'm just beyond the half-way point of The Ladies' Paradise. Emile Zola is becoming a new favorite! Wuthering Heights Wednesday read-along, hosted by Jill at Fizzy Thoughts has begun. Quite a few participants (like me) are first-time readers. The book's darkness took me by surprise - not at all what I was expecting! I'm really enjoying it, but don't foresee much happiness for these characters. The next post is coming on Wednesday. 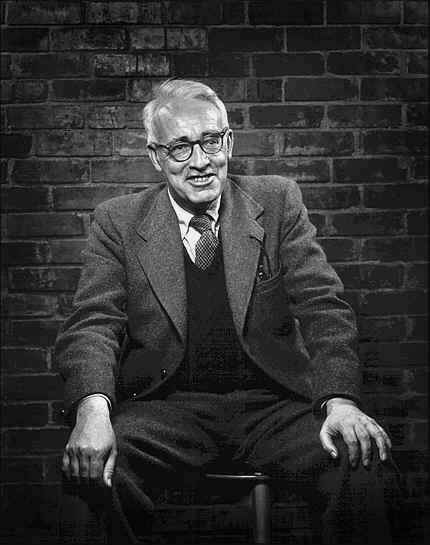 A new author discovery last week... My Short Story Monday post, Frank O'Connor's "First Confession", had everything I expected from an Irish author. Are you familiar with O'Connor? Any suggestions for further reading? 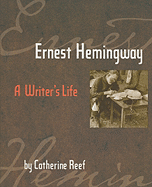 My review of Ernest Hemingway: A Writer's Life by Catherine Reef was posted Friday. This provided just the right amount of background information for A Moveable Feast (which I hope to start by the end of the week). It may be quiet at Lakeside Musing for a few days as I continue with Wuthering Heights and finish The Ladies' Paradise. The Forgotten Garden by Kate Morton is still on my iPod. It's an excellent audio and drew me in right away, but I haven't been very good about walking this week. Hope all the read-a-thon participants catch up on sleep. I need to catch up on reading! Which will you be doing? 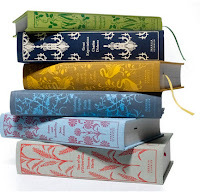 Today is read-a-thon, so I'm not sure if any book bloggers are cooking. 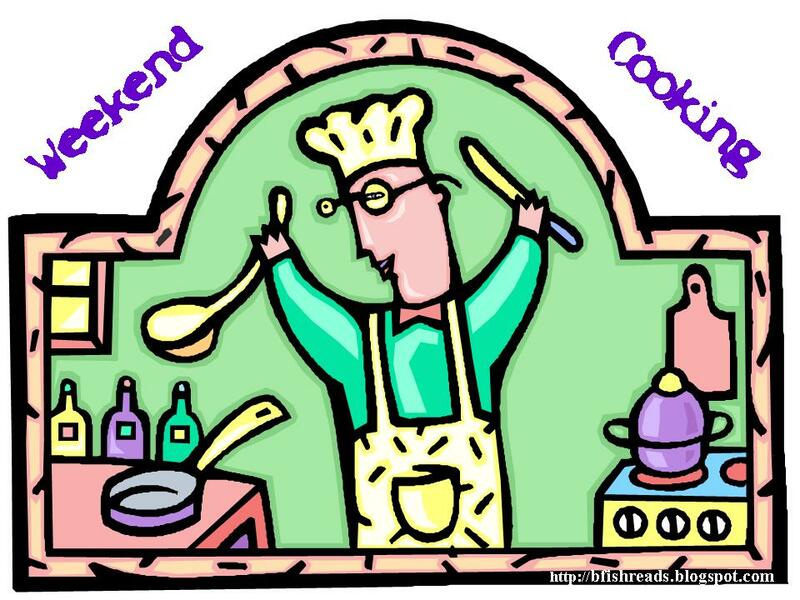 I do have a Weekend Cooking post to share... it's at Lakeside Kitchen today. There are times when I love to lose myself in a big, fat literary biography, but then there are others that call for a more concise, compact volume. I was recently seeking the latter and Ernest Hemingway: A Writer's Life by Catherine Reef filled the need perfectly. My April reading plans include A Moveable Feast, and Molly's review planted the idea that a better understanding of Hemingway's life might increase my appreciation of the book. A few days later, I came across Diane's review of Ernest Hemingway: A Writer's Life, and then happily discovered the library had an available copy. While aimed at 9-12 year-olds (I think that range is a little too young), Reef's 150-page book was exactly what I needed to fill in the gaps. I learned more about Hemingway's childhood, time in Paris, hunting and fishing expeditions, war experience, writing career, marital turmoil, and the mental illness that eventually lead to taking his own life. My husband's grandmother, author of two novels published in the 1930's, was acquainted with Hemingway and, according to family lore, "didn't think much of him". He may not have been a particularly likable person, but this book provided an interesting look at the man behind the classic novels. Bottom line: Highly recommended, even if you're not planning to read A Moveable Feast anytime soon. Welcome to the Wuthering Heights Wednesday read-along hosted by Jill at Fizzy Thoughts. Our plan is to read three chapters of Emily Bronte's novel per week and post our thoughts each Wednesday. If you'd like to join us, it's not too late! Our narrator Lockwood, a man who seems to consider himself highly civilized, has just rented the remote Thrushcross Grange and arrives at Wuthering Heights to call on his landlord, Mr. Heathcliff. The inhabitants of Wuthering Heights appear unfriendly and standoffish (or just downright rude), but Lockwood in undaunted and vows to return for a second visit. When Lockwood next visits, a snowstorm strands him overnight at Wuthering Heights. The housekeeper, Zillah, puts him in a little-used room that may be haunted. Lockwood has horrible nightmares that awaken the household. Lockwood returns home the next day. His servants, presuming he died on the moors overnight and preparing a search for his remains, are thrilled to see him. From the very first paragraph, the setting is described as "completely removed from the stir of society" and "a perfect misanthropist's heaven". I doubt anything good is going to happen here! Next, the characters at Wuthering Heights (even the dogs) seem incredibly rude. Lockwood appears to be sort of a jerk - it seemed pretty obvious to me that a second visit would not be welcomed. Catherine, the daughter-in-law, threw me. I knew the novel focuses on the Catherine/Heathcliff relationship, but now it appears we have two Catherines! I'm also not quite sure of how the younger man, Hareton Earnshaw, is related to Catherine and Heathcliff. The violence of the dream scene (quoted above) was startling! How could an author even come up with the idea of rubbing a child's (albeit a ghost/child) wrists back and forth over shattered glass? After just three chapters, I'm convinced this is going to be a wild ride! Jill's first post with a link to other participant's blogs can be found here. March may be over, but I'm still reading Irish authors. 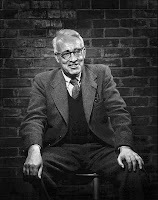 Frank O'Connor (1903 - 1966) is best known for his short stories and memoirs. In "First Confession", I found all the elements I've come to expect in Irish fiction - religion, family disagreements, guilt, and alcohol. "All the trouble began when my grandfather died and my grandmother - my father's mother - came to live with us." We learn that the grandmother, a country woman, is unsuited to life in town. She walks around the house barefoot, eats with her fingers, and drinks quite a bit of porter - straight from the jug. The narrator, a seven-year-old boy named Jackie, is mortified by this behavior, while his older sister Nora "sucked up to the old woman for the penny she got every Friday out of the old-age pension..."
In one instance, we find Jackie, who refuses to eat any meal prepared by his grandmother, hiding under the table threatening to protect himself with a butter knife as Nora tries to force the food upon him. Jackie is preparing for his first confession and communion. The teacher, who talks mostly about hell, has scared him to death. When the day of confession arrives, Jackie's mother sends Nora to accompany him to the church. "Now that girl had ways of tormenting me that Mother never knew of. She held my hand as we went down the hill, smiling sadly and saying how sorry she was for me, as if she were bringing me to the hospital for an operation. "Oh, God help us!" she moaned. "Isn't it a terrible pity you weren't a good boy? Oh, Jackie, my heart bleeds for you! How will you ever think of all your sins? Don't forget you have to tell him about the time you kicked Gran on the shin." Nora goes to confession first. "Nora's turn came, and I heard the sound of something slamming, and then her voice as if butter wouldn't melt in her mouth, and then another slam, and out she came. God, the hypocrisy of women! Her eyes were lowered, her head was bowed, and her hands were joined very low down on her stomach, and she walked up the aisle to the side alter looking like a saint. You never saw such an exhibition of devotion; and I remember the devilish malice with which she had tormented me all the way from our door, and wondered were all religious people like that, really." Jackie's turn follows. The description of the confession is quite comical and well worth reading. The entire piece is about five pages long and can be found here. I loved this story and will look for others by Frank O'Connor. Happy Easter! The coffee is brewing, the Easter Baskets are on the table waiting for the girls to wake up, and Nan's Baked French Toast is in the oven. Before our day starts, I'd like to thank all of you for your thoughts and prayers following my Aunt's death last week. Although it was a sad time, the funeral was truly beautiful and it was a blessing to have all the family together. Needless to say, not much reading happened last week. I only managed a single chapter in The Ladies' Paradise by Emile Zola. The review for The Classics Circuit is scheduled for the 17th, so it will be my primary focus this week. 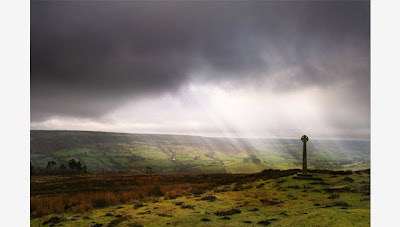 Also starting this week, Jill at Fizzy Thoughts is hosting a Wuthering Heights Read-along. The pace will be a slow and leisurely three chapters per week, and we'll be posting our thoughts on Wednesdays. I was surprised to learn that a few other people have not read the book - I truly thought I was the only one! Blogger reaction to Wuthering Heights seems to be mixed, although I'll admit to seeing more "I hated it" comments. In any event, you'll be seeing Wuthering Heights Wednesday posts here for the next couple of months. If you haven't read this classic or are in the mood for a reread, grab the button (isn't it fantastic?) and join us! My April reading plans also include A Moveable Feast by Ernest Hemingway (a follow-up to the biography I recently finished) and The Magic Toyshop by Angela Carter (for Paperback Reader's Angela Carter Month). Have a Happy Easter, and I hope you can fit in at least a little reading time today. 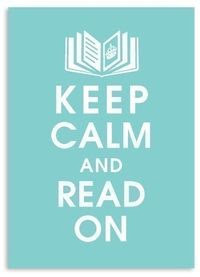 Do you have any April reading projects planned?